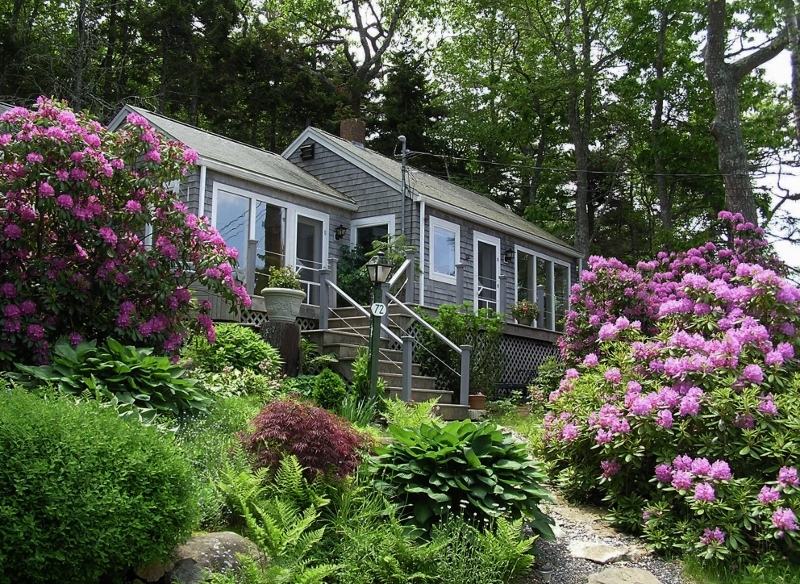 Paradise Cottage is rented weekly, Saturday to Saturday, Shoulder & Summer Seasons. Fall, Winter and Spring have a two night minimum, or you can rent by the month January – June. Children count as people! 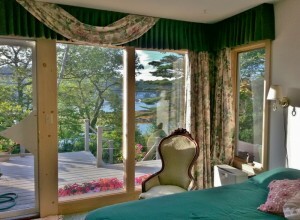 We calculate our rates for Paradise Cottage according to the number of guests. All rates shown below are our discounted prices for payment only by cash or check. To pay by any other method, please inquire for our regular season rates and let us know what method you prefer to use. SHOULDER SEASONS (two weeks at each end of summer, June 23 – July 6, 2018, & August 25 – September 7, 2018) – Weekly rentals only. Maximum 4 private, total 6 people when including 2 small children. Four adults is maximum for this small house. $1490/week for 1 – 3 people; $1690/week for 4 – 6 people (the latter including 2 small children). SUMMER SEASON (July 7– August 24, 2018) – Weekly rentals only. Maximum 4 adults, private; total 6 people with the inclusion of 2 small children. $1590/week for 1 – 3 people; $1790/week for 4 – 6 people (the latter including 2 small children). FALL & SPRING (May 26 – June 22, 2018 & September 8 – October 26, 2018) Two night minimum. Maximum 4 adults, private; total 6 people with the inclusion of 2 small children. 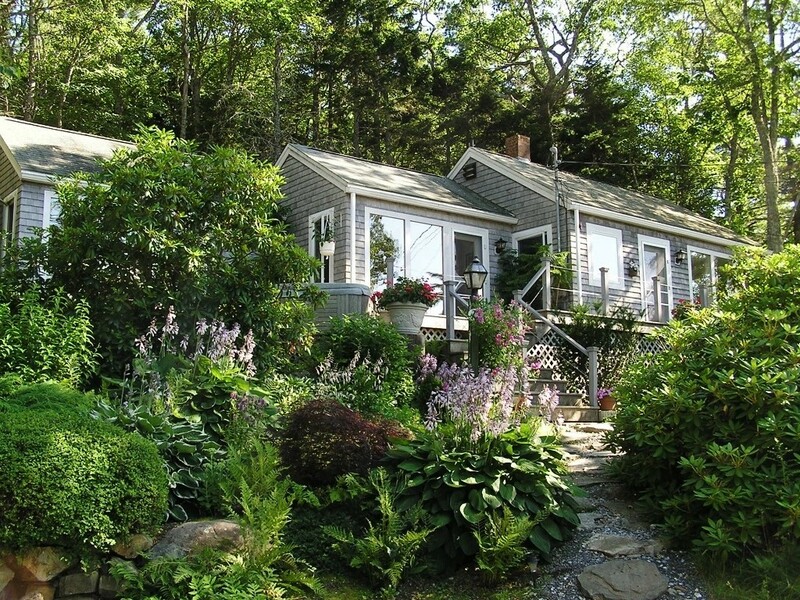 $1290/week or $185/night 1-2 people; $1590/week 3 – 6 people (the latter including 2 small children). Also MONTHLY rates for April, September, and October at $1200/mo. and May at $1400/mo. + utilities, and June (actually May 20 – June 16, 2017) at $3000/mo. including utilities. WINTER SEASON (October 28, 2017 – May 25, 2018) – Two night Minimum. 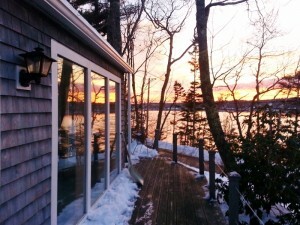 Winter is such a peaceful time at Paradise Cottage. Sit by the fire and enjoy watching the weather waft across the bay, ice floats, and the wildlife. We have wild turkeys, deer, fox, many species of ducks, eagles, and of course seagulls. The Opera House has events throughout the winter and four of the best restaurants remain open. The Coastal Maine Botanical Gardens have Gardens Aglow from the end of November through the end of December; after which time they are open and free. 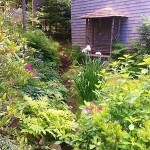 Boothbay Region Land Trust is always open for hiking or X-Country skiing or snowshoeing. Two people can enjoy three nights of pristine relaxation at Paradise Cottage for $410 ($490 for 4 people) and get a third night FREE! 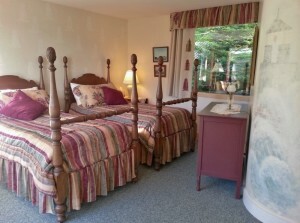 or rent a week at $990 and stay 2 extra nights at no more charge. Rent two weeks and get a 10% discount. 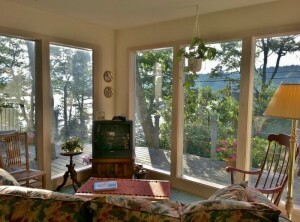 Also MONTHLY in Winter: If you would like to experience the delight of a Maine winter ON THE WATER for a longer period, we offer at Paradise Cottage a monthly rental rate for November through May 25, 2018, of $1200/month plus utilities for one or two people. 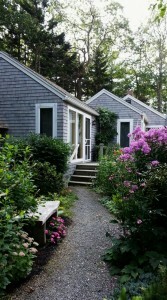 Winter utilities at Paradise Cottage can run anywhere between $150 and $400 per month depending on how you manage them. Firewood is the least expensive heat and we will source that for you. The REFUNDABLE deposit to hold your reservation and secure against your utilities for these longer term rentals varies according to the length and season of your stay, but will be returned after you leave if everything is as you found it, except that we will itemize and subtract your utilities as necessary. We will coordinate with you before you leave to close out your account. This is based on two person occupancy. Children count as people! No pets for long-term winter stays. Snug and toasty by the fire, you can watch storms sweep across the bay, sea smoke if it is cold enough, seagulls riding the updrafts when the wind is out of the west, and an occasional eagle. In Boothbay Harbor, just three miles away, at least one of the best restaurants is open every day and there is plenty of parking; the pace is a little slower and the attention a little warmer. There are many events around the holidays including Gardens Aglow through the end of December at the Botanical Gardens when the whole town is decorated, and the historic Opera House has programs (not opera) year-round. Linen Service: Many people bring their own linens, or you may use our linen service for $50 per stay ($25 for just two people). This includes sheets, towels and kitchen linens for the whole house and all your guests for your entire time. You are welcome to use as many of our pillows and blankets, provided to make the beds to suit your own desires, whether or not you bring your own linens. You will find bed sizes here under the room descriptions in the “Amenities” section on the drop-down menu at the top of each page. Pet Fee: We charge $150 for one pet, plus $100 for each additional pet. $50 of each is partially or wholly refundable depending on damage, grounds clean-up, and how much time we must spend cleaning specifically after the animal(s) on your departure. State tax: We are required to collect 9% lodging tax for the state starting January 1, 2016. We will figure the correct amount and include it in your contract. Credit Cards: All rates shown are our discounted prices for payment only by cash or check. To pay by any other method, please inquire for our regular season rates and let us know what method you prefer to use. For reservations made a year or more in advance, one half the deposit (or one quarter of the rent) is all that is required until January 1 of the year you are coming, and it will be wholly and completely refundable until then. The remainder of the deposit, which is the second quarter of the rent, will be due January first with the balance (remaining half) of the rent to be paid on your arrival. Cancellation and Re-booking Fee: One half the total rent is payable in advance as a deposit to hold your time; the remainder is due on arrival. Our cancellation policy is as follows: Should your circumstances dictate a change in plan, you must notify us at least 30 days prior to your arrival date and if we are able to re-rent your stay, we will refund your deposit less $100 per week reserved re-booking fee or you may choose to reschedule for another available time.